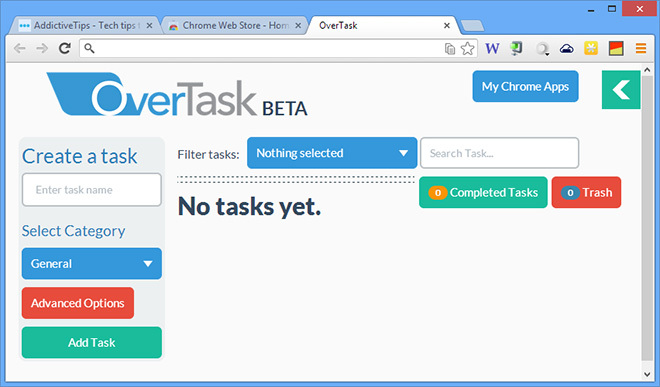 OverTask is a handy Chrome extension to manage not only your tabs, but also your tasks in a new fashion. Instead of relying on some previously introduced, tried-and-tested formula, the extension comes with a twist and lets you manage your tabs as parts of tasks that you’re performing. These tasks-based tabs can be organized in multiple task groups so you may make the best out of your web browsing session by keeping related tasks together. Furthermore, you can also prioritize these tasks and even assign due dates to them. OverTask allows you to group your tabs into different tasks, for instance there can be a tasks group for for a project you’re working on, another for a mean you’re planning to cook, and similar ones for general activities, fun and so on. This also makes it possible to save your tab groups and open them at a later time with one click. Once installed, OverTask takes over your default New Tab page. The extension’s new tab page looks really user-friendly and explains things well with some tooltips. Here, you create, manage and remove your tasks as well as mark the finished ones as complete. To create a new task, simply use the ‘Create a task’ option on the left, specify your task name, category, priority, and due date (if any). If you want to add your currently opened tabs to this task, click ‘Add current tabs to task’ followed by clicking ‘Add Task’. As you keep adding tasks, the list appears on your dashboard allowing you to easily access, remove or complete them. Clicking the ‘View’ button in the lower-right corner of each task instantly opens all the pertaining tabs it carries, and shows a new screen where you can add and remove your desired tabs.